Food – this is the actual food file. This controls how Sims eat the food. Food container – Sims need to get the food from somewhere. So you need to clone a food container object and code it to supply your custom food files. This object controls how and when Sims get the food. Single meal – this is eaten by 1 Sim. Eg, a slice of pizza, a snack, a small dish of food. Group meal – up to 6 Sims can grab the same single meal from this. Eg, a pizza box contains 6 slices of pizza. 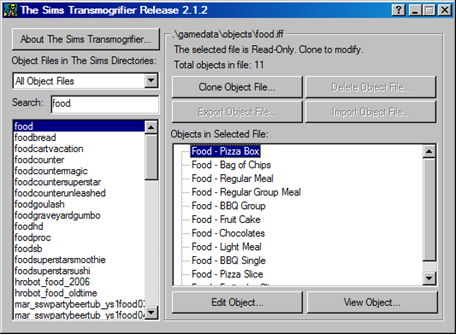 If you open the Sims “food” file in Transmogrifier (Tmog), you will see it includes the single and group versions of each food. *The single and group meals of each food have separate GUIDs. Hence a food container can link to the single or group meal of the same food separately. This tutorial only deals with step 3. I assume you know how to do steps 1 and 2 (visit Bunny Wuffles at http://sas.woobsha.com/ if you need help on basic object making). You will need iff pencil2 for this. Download at http://www.ctosims.com/ under "The Files" > "General Files" > "Programs" (free registration – seriously worth it). 1. Open the food container file in iff pencil2. Click on BHAV on the left menu. 2. On the right menu, find and double click the line with “create food in hand” (typically #4214). 4. 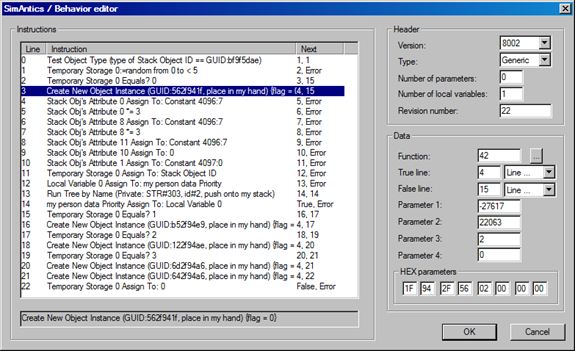 Replace the GUID number with your custom food GUID in bottom right HEX parameter box (usually first 4 sets of numbers). * To make your life a wee bit more difficult, GUID numbers are NOT entered in straight sequence, but in reverse and in groups of 2. Eg, for GUID 12ABCD78, you need to input as HEX 78 CD AB 12. Fun! * It is best to replace an existing food with the same type of custom food – group meal for group meal, snack for snack (read more below). 5. Save and close. You are done! Now test it in game and enjoy! That wasn’t so hard! But before you rush off, you need to decide which food and food container you would like to use. They all behave differently! So read on. Snack – single meal with minimal hunger boost. Sims eat without sitting. Regular meal – Sims will grab a plate and sit down to eat. Most filling. Need to clean up individual dishes and the group dish after. Fridge – the good old fridge allows Sims to get single snacks and take ingredients out to prepare a group meal. Sims can choose by a menu. 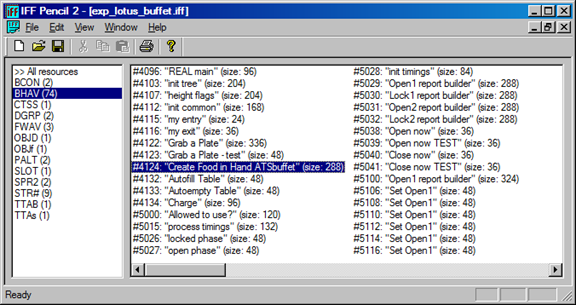 Buffet – Sims will grab random single meals (cannot choose from menu). Need to clean up after, which sometimes freezes my game. Microwave – Sims can grab quick single meals. Sims can choose by a menu. Bakery – a hacked microwave by SSOW. Choice of 5 different food types from menu: single snack (in the form of a donut), single or group pizza (muffins), quick group meal (toast and jam), group regular meal (bread). Simlogical hotel tray (uses Sims food files) - Simlogical under "objects with restrictions"
SSOW bakery + different foods - Secret Society of Woobsha under "better kitchens"
ATS buffet + single meals (hacked quick meals: no sitting, no dish cleaning) - Around the Sims under "food and drinks"
Expression hacked hotel tray + single meals - this site under "Lotus Dining room"
Expression bakery + different foods (similar to SSOW bakery) - this site under "Chinese New Year set Day 3"
- When cloning a food file, it is best to select BOTH the single and group meals in the file for cloning. - Single and group meals have different states of being eaten (eg, not eaten, ½ eaten, empty). You don’t necessarily need to make different sprites for each state. - I also don’t bother with more than 1 rotation. To me, too many sprites take the joy out of creating. Not worth it la. You know you can just check “Flip” in Tmog to instantly get 2 rotations of the same sprites, right?